One of the most highlighted tournaments of the year, Bashundhara Cup Golf Tournament 2013 came to a successful end after two days of consecutive golfing at the Savar Golf Club in Savar on Friday. A prize giving ceremony was held in the evening. The Chairman of the Bashundhara Group, Mr Ahmed Akbar Sobhan was present during the prize giving ceremony. A total of 203 golf players including 52 foreign golfers participated in this prestigious tournament braving awful weather condition and proved their enthusiasm towards golf. Previously, 62 golfers enjoyed golfing at the Savar golf course on the first day of the tournament. Brigadier General Shikder topped the leaderboard in the first day playing 77 shots to earn a score of 6-under-par with the advantage of 11 handicaps. The first tee off of the second day started at 6 am for the 18 holes category while, the 9 holes category tee off went on going from 10 am onward. 141 golfers played golf all around the course in different section in the second day to compete for the prestigious trophy. It was a tough golfing competition in such rainy and soaked up condition as a result, golfers faced tough time dealing with it. After the completion of all golfing competitions, the prize giving ceremony of this tournament started later at 5 pm in the Club House Complex of the Savar Golf Club. The honourable chairman of the Bashundhara Group, Mr. Ahmed Akbar Sobhan was present in the prize giving ceremony. The chief guest of the event Forest and Environment minister Dr. Hasan Mahmud, MP arrived on time along with the General Officer Commanding (GOC) of the 9 Infantry Division and Senior Vice President of the Savar Golf Club, Major General Chowdhury Hasan Sarwardy, Bir Bikram, ndc, psc. 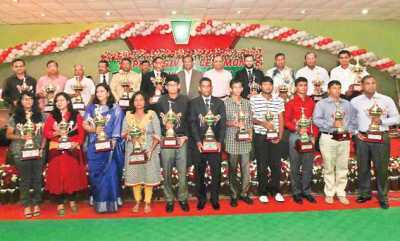 The prize giving ceremony was hosted by Lieutenant Colonel Tauhid of the Savar Golf Club and the event started by showing respect to the departed souls of the Savar tragedy. Head of tournament committee, Brigadier General Saiful Abedin praised Bashundhara Group for encouraging golf and appreciated their motto which is “Play Golf, Live long”. Major General Chowdhury Hasan Sarwardy thanked Bashundhara for arranging this tournament and hoped that Bashundhara Group would keep on this good relationship with Savar Golf Club. Lieutenant Colonel (Retd.) Abdul Wahed, Head of HR and Public Relation and Advisor of the Bashundhara Group, said that the Bashundhara Group is happy to organize such tournament. “Bashundhara Group have always promoted sports all around the country especially for the young generations and this company will keep this aspect going,” said Mr. Wahed. Honourable minister Dr. Hasan Mahmud was very happy to attend as the chief guest of this golfing event and he acknowledged Bashundhara Group as one of the most active business companies nationwide and appreciated all their economic contribution for the country. The Winner of the Gents (18 hole) category which is the main highlight of this event was fortnight leader Brigadier General Shikder with his gross 77, net 66 score which is 6-under-par. Shadman Sider and Major Towfiq managed to win the 1st runner up and 2nd runner up honours in this category. Best Gross winner was Major General Masud Razzak with a gross score of 75. Siam took away the 2nd Best Gross with a gross score of 76. Mafizul Islam and KM Nobiruzzaman grabbed the Best Front Nine and Best Back Nine prizes respectively. GOC of the 9 Infantry clinched the winner prize in the Gents (9 hole) category followed by Brigadier General Razzak who managed the runner up trophy. Mrs. Kusum Farid earned the Ladies (9 hole) Winner trophy competing with 17 other lady golfer. Among the Junior golfers, Maliha clinched the Winner trophy by getting lower score than her seven other Junior opponents. Bashundhara Group representative, Mr. Wahed won the ‘Conventional On’ which is one of the common prizes of the tournament which can be won by any golfer from any category. Mr. Mahi won the ‘Maximum Par’ award by earning 12 pars in the tournament while, Major Arman earned the ‘Longest Drive’ award by hitting a massive 295 yard drive. There was also a competition for the Ball boys and Caddies. Ball boy Md. Sadek won with a 162 gross score which is 18-over-par from two rounds. Mr. Badal was the Caddy winner who could manage 6-over-par with a gross score of 294 from four rounds. The eventful ceremony ended with a cultural program and a raffle draw where the participating golfers and guests won many attractive prizes which were provided by the Bashundhara Group.